Success! Kyay from Burma raised $1,500 to fund abdominal surgery. Kyay's treatment was fully funded on February 10, 2018. All of her previous symptoms have disappeared, and she feels much better. Kyay is a 52-year-old farmer from Burma. She has four children. She owns a farm with her husband, where they grow rice and beans. Currently, Kyay is in a lot of pain. She has a bile duct stone, which prevents her from sleeping, eating, and walking comfortably. She is very worried about her condition and how it will affect her family. Kyay has been advised to undergo a biliary obstruction repair, a procedure to repair the blockage of the bile ducts, which carry bile from the liver to the gallbladder. If left untreated, Kyay’s symptoms will continue to worsen and put her at risk for further health complications in the future. After seeking treatment through our medical partner, Burma Children Medical Fund (BCMF), Kyay is scheduled to undergo her biliary obstruction repair on February 8. BCMF is requesting $1,500 to cover the total cost of Kyay’s procedure and care. 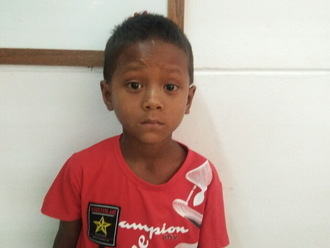 Kyay's case was submitted by Bue Wah Say at Burma Children Medical Fund in Burma. Kyay was submitted by Bue Wah Say, Project Officer at Burma Children Medical Fund, our medical partner in Burma. Kyay's profile was published to start raising funds. Kyay received treatment at Mae Sot General Hospital. Medical partners often provide care to patients accepted by Watsi before those patients are fully funded, operating under the guarantee that the cost of care will be paid for by donors. Kyay's treatment was fully funded. Kyay's treatment was successful. Read the update.